Going South on I89: Take exit 20. Turn left at end of ramp onto Route 12A North. Go through three traffic lights. We are the second building on the left. 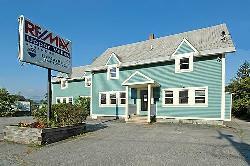 We are on the first floor of the RE/MAX Upper Valley building. Enter via the ramp around back. Going North on I89: Take exit 20. Turn right at end of ramp onto Route 12A North. Go through two traffic lights. We are the second building on the left. We are on the first floor of the RE/MAX Upper Valley building. Enter via the ramp around back. To get turn by turn directions and map from your location please click here.